Tiered rings as loot and sold at clothing traders! New crafting mechanics and gem components! Custom legendary effects and material modifications! Crafting recipies move to Chemistry station. 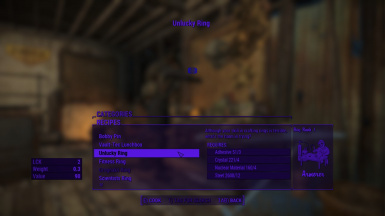 Pipboy removed from this mod. Added Survival option, rebalanced mod for new survival difficulty. Increased containers rings will spawn in. Initial release of crafting and gems components. Lowered common ring drop chance. Raised legendary ring drop chance. Pipboys added to Alexis Combes for sale in Vault 81. Adding Shines to the commonwealth! 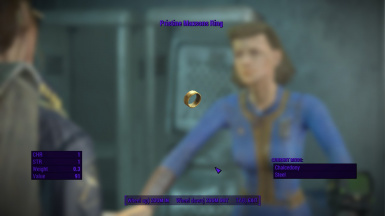 I thought it was weird that Bethesda dedicated an entire armor slot to rings, but only put 2 in the game. So I decided to expand on it and gives rings a purpose. 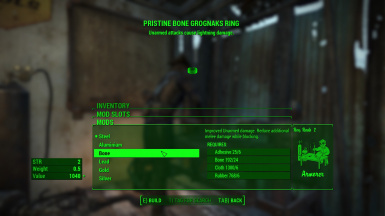 Base rings add SPECIAL stats. +hp and +ap rings for each tier. Cost at venders will vary A LOT. Worn tier +1 stat, any level, 100 value. 10 variations. Pristine tier +2 stats, level 15-20, 200 value. 30 variations. Atomic tier +3 stats, level 30-40, 300 value. 86 variations. Worn tier +1 stat, level 10+, 70 value. 10 variations. Pristine tier +2 stats, level 25+, 140 value. 30 variations. 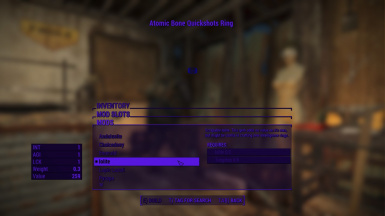 Applying new Survival setting of my mod to an old save will remove all atomic rings so be careful! 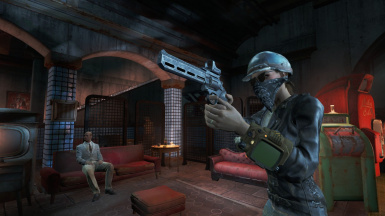 The Survival setting can be used on any difficulty level if you feel normal is to OP. 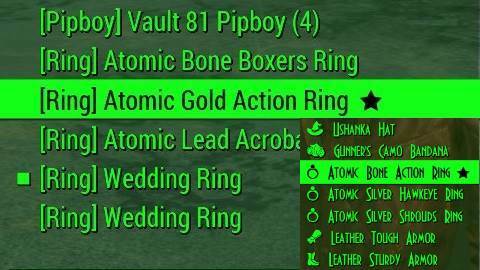 Rings are sold at Fallon's Basement in Diamond City, and many other traders across the Commonwealth. 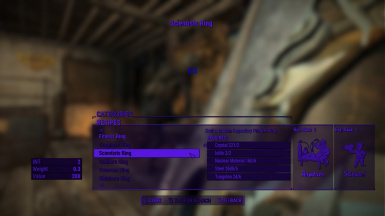 Rings also drop in tons of places, cabinets, suitcases, etc..
All rings have custom materials to craft at the vanilla armor workbench. 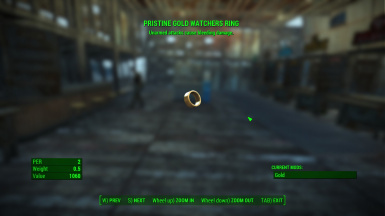 Random legendary rings spawn at clothing traders, trunks, and safes! Rings support 33 total Legendary effects, 14 custom ring only effects! New ring crafting mechanics and gem components in 1.0.8! 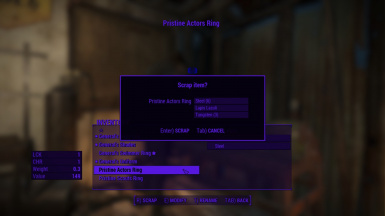 Scrap non-legendary pristine rings for materials used in making legendary pristine rings! Crafted rings pull from a smaller, better list of legendary effects. Recipes in the "Utility" tab of the chem workbench. Stats are bound to the ring not the gem, so replacing the gem in a common ring will not change the stats. I would love to add custom textures and models to my rings, but I'm not an artist. Please send me a message if your interested in working with me on the art side of modding. Old patch notes in readme file. 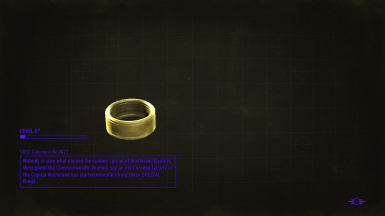 Pipboy has been removed from this mod as of 1.0.8. It is now a separate mod. The Loot Options file contains all overrides to base game. Main mod has only custom files. 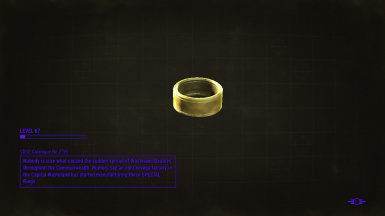 Loot options contain balance changes to wedding rings. 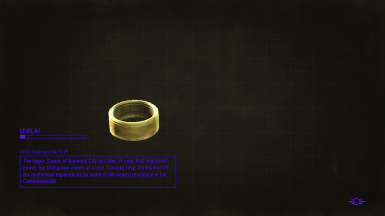 This will override any other changes to wedding rings, as long as its loaded after other mods. Works with DEF_UI ring icons! Here is a simple video tutorial on how to merge level lists with FO4Edit. Anyone modding their game should learn to do this, it's easier then you think trust me. Loot options have a high risk of conflict with any other mod that changes container, or trader level lists. 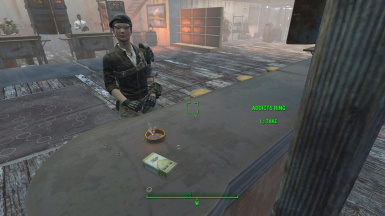 This mod will also conflict with any other mod that edits the container files for Becky Fallon or the settlement clothing trader. 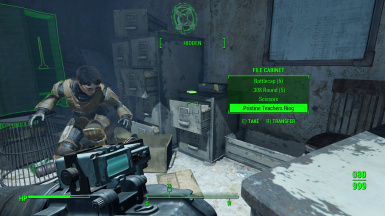 This mod makes no changes to NPC loot, only container and trader level lists. This mod uses the default armor flags. Rings are 51. Any mod that drastically changes armor flags will conflict. 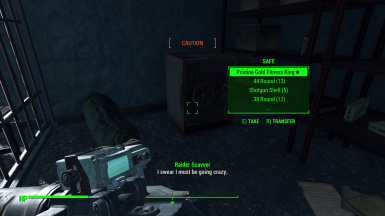 Mods that overhaul factions are typically safe to load after my mod. They might override some of my level lists though. 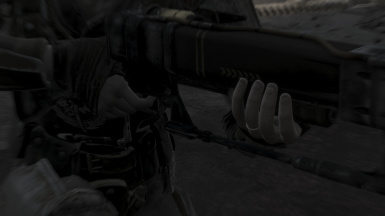 Wasteland Imports is a conflict nightmare with my mod. You will lose drops from the first mod loaded unless you merge them yourself. Rad-Ban Eyewear Inc. conflicts at some traders, works fine as long as you load my Loot Options mod after. You will still find the glasses at traders I don't use like DC Surplus. I personally use Armorsmith Extended with no issues. Load my Loot Options after to insure wedding ring balance! Let me know if you think any mod I haven't listed conflicts with mine. 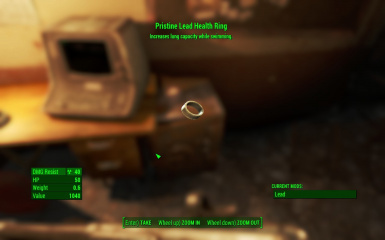 I recommend loading the loot options mod AFTER other armor mods, this is to insure wedding ring balance. To manually install find the appropriate "Main Mod" and "Loot Options" file. You must use a loot options file, otherwise you have no way to loot anything. The 2 .esp files go into your Fallout4\Data Folder, and enable mods. Please leave a comment if your having trouble installing, or have any questions. updating will cause all currently owned rings to disappear. I'm very sorry for the inconvenience this will cause. This should not happen again with the format change. If you currently use 1.0.5 or lower, updating will destroy all crafted legendary effects on rings. All ring legendary effects are now custom and can't be crafted individually.